Dr. Alex Millan has a friendly and easy going personality. He treats his patients like they are family and prides himself in providing exceptional care and service. He is eager to show his patients that a dental visit can be a pleasant and comfortable experience. 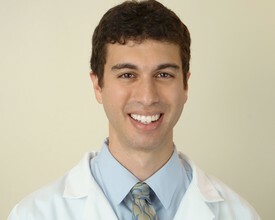 Dr. Millan was born and raised in Huntingdon Valley, Pennsylvania. He graduated from Schreyer Honors College at The Pennsylvania State University and attended The Maurice H. Kornberg School of Dentistry at Temple University. Dr. Millan was inspired to go into dentistry by his father who is a dentist practicing in Philadelphia. Dr. Millan is committed to furthering his dental education. He implements the latest dental procedures and technologies. For the past several years, Dr. Millan has been working in private practices, treating patients with a variety of dental conditions. He is comfortable working with patients of all ages. He is a member of the Academy of General Dentistry and is working toward his fellowship. When he is not practicing dentistry, Dr. Millan enjoys working out, playing tennis and golf, and rooting for Philadelphia sports teams. His wife Rachel grew up in Dresher, Pennsylvania. They have a one year old son, Harrison who keeps them very busy and happy.